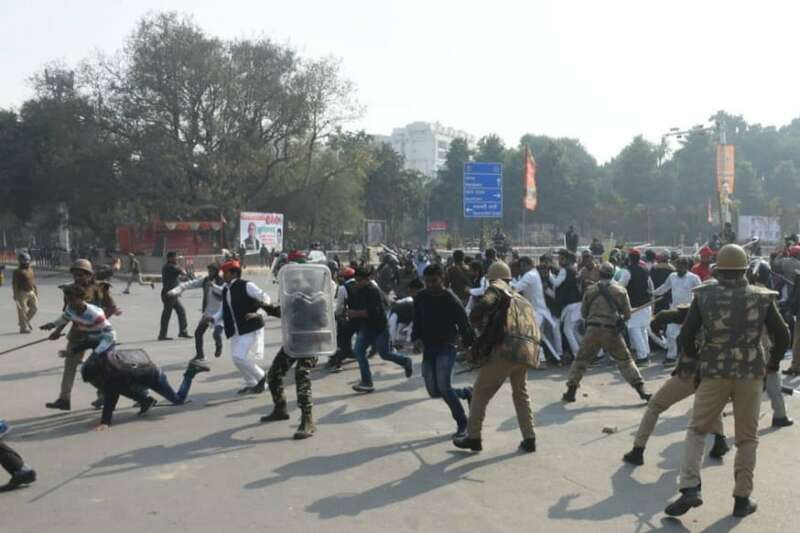 Prayagraj: Samajwadi Party leaders and workers were lathicharged by the police in Prayagraj during protests triggered by the Yogi Adityanath government’s denial of permission for SP chief Akhilesh Yadav to travel to the city. In the clashes, SP MP Dharmendra Yadav was among the partymen injured. Akhilesh Yadav has claimed that he was stopped by authorities at Lucknow airport in a bid to prevent him from visiting Allahabad, renamed Prayagraj last year, triggering protests by party lawmakers in the state legislature, outside the airport and in Prayagraj. The former Uttar Pradesh chief minister said he was to fly to Allahabad from Chaudhary Charan Singh International Airport to attend an event at Allahabad University. "The government is afraid of oath-taking ceremony of a student leader and is stopping me at the airport to prevent me from visiting Allahabad," Yadav said on Twitter. But the airport director AK Sharma said, "I have no such information." The issue also rocked the Uttar Pradesh legislature. As soon as Samajwadi Party members came to know about their national president being stopped at the airport, they raised the matter during Question Hour in the assembly. "The present regime is trying to kill democracy and stop our leader from visiting Allahabad," SP leader Narendra Verma said. The members also trooped into the Well, prompting Speaker Hriday Narain Dixit to adjourn proceedings for 20 minutes. It was later extended for the entire Question Hour. When the House reassembled, agitated SP members again rushed to the Well and sat on a dharna, shouting slogans against the Yogi Adityanath government. "Yogi teri tanashahi nahi chalegi (Yogi government's anarchy will not be tolerated)," they shouted. Similar protests also paralysed Parliament proceedings. "The Allahabad University had urged the government to stop his visit and the government acted," the chief minister said. "It is clear how frightened the govt is by the oath ceremony of a student leader. The BJP knows that youth of our great country will not tolerate this injustice anymore!" Yadav tweeted.